For details and costs of our basic events provision click here. There are a range of optional extras to ensure your day is just how you would like it. All prices include installation and clear-up. If there is anything you would like that isn't listed here do talk to us about it, as we may be able to provide it, or recommend a good supplier. All prices subject to change. We can offer round tables or oblong trestle tables. Our round tables are 5' in diameter and sit 8 people easily, or 9 if necessary. The trestle tables have solid wooden tops, are 6' by 2' wide and seat 6 people – 3 each side (4 if children). We use high quality beechwood folding chairs, or some benches are available if you prefer. There is a charge of £25 each for breakages of chairs. Tablecloths, or hessian fronts if appropriate, are included in the price. A range of outside seating (picnic tables, rugs, benches etc.) is included in your main package. Our reliable, sourced sound-system provider can hire out a simple but very effective sound and lighting set-up, fully installed and ready to go at a very competitive price. If you would like us to arrange this (no added charge from us) just let us know. 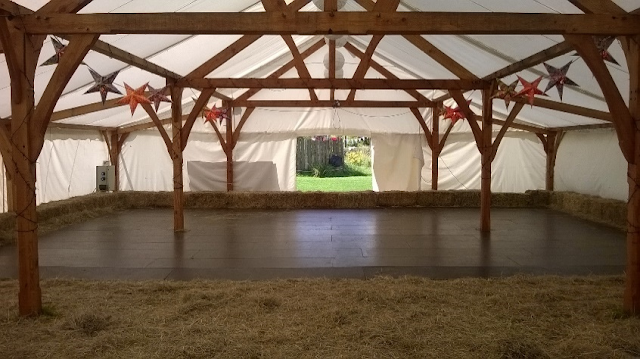 Perfectly complementing our main timber framed marquee, our Jousting Tent is a versatile space limited only by your imagination. Most popular decorated up for a bit of luxury glamping, it has also previously been used as a dedicated photo booth, and as a face painting and dressing up area. What could you do with it…? The natural grass floor of our field can contribute to the overall feel of our events, but you may like to have an area of the marquee laid down as an official dance floor. We are happy to provide and install this. The garden is available for guests to enjoy during their stay. If you would like, we can set up lighting in the garden so that it can also be enjoyed after dark. 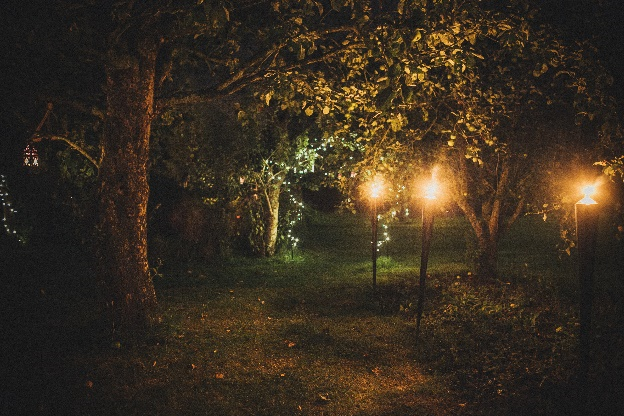 This will include spotlights under trees, fairy lights, candle-lit lanterns, paraffin torches and a fire-pit. This is our most popular ‘special touch’ and creates a magical space for your guests to relax and enjoy. The guesthouse, including its main double bedroom and twin room, is available free to the bride and groom and nominated guests on the night of the event. You are also welcome to book it on nights either side of the event. Extra nights: £75 per night for whole guesthouse (sleeps ups to 6 including sofa bed). Use of the guesthouse is restricted to nominated guests only. We can host informal ceremonies (that is, those not requiring a licence, such as handfastings) on the farm. In the past these have taken place either in the stone circle, under a gazebo in the field, in the garden, or in the marquee itself. It may also be possible to arrange a ceremony in the woodland (although guests who are less mobile may find this hard to access). 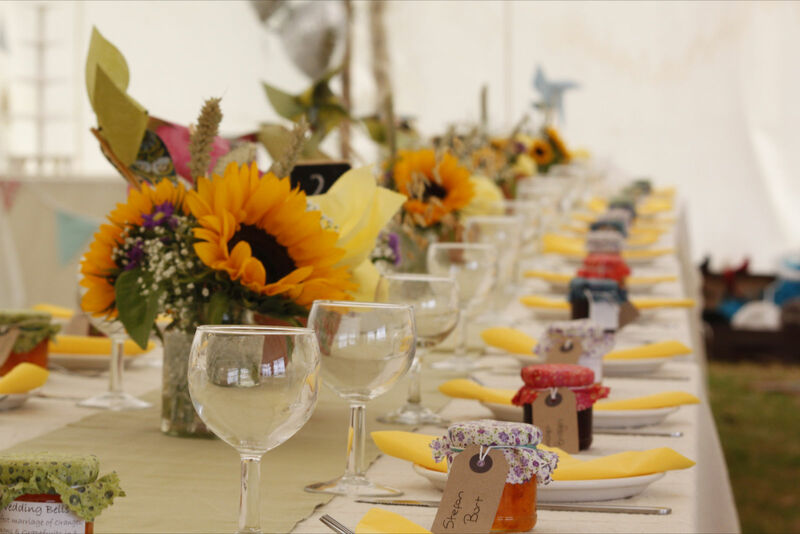 The cost of preparing and setting up a site for the ceremony would depend on the exact nature of the event – as always we would be very pleased to talk to you about your ideas. We can set up a bar to serve alcohol and other drinks, either inside or outside the marquee. There are two main options here. The first is to have a 'free' bar, where you provide the drinks, which are free to guests. You are welcome to have a donations box to help cover costs with this option. The second is to have a 'charged' bar, where we supply the drinks, and charge guests for them. In either case we can provide, set-up and run the bar throughout. We can also offer the option of a fridge van to keep drinks (and food if necessary) cool. If you prefer, you’re welcome to use a third party to supply the bar, but all alcohol suppliers must be licensed. 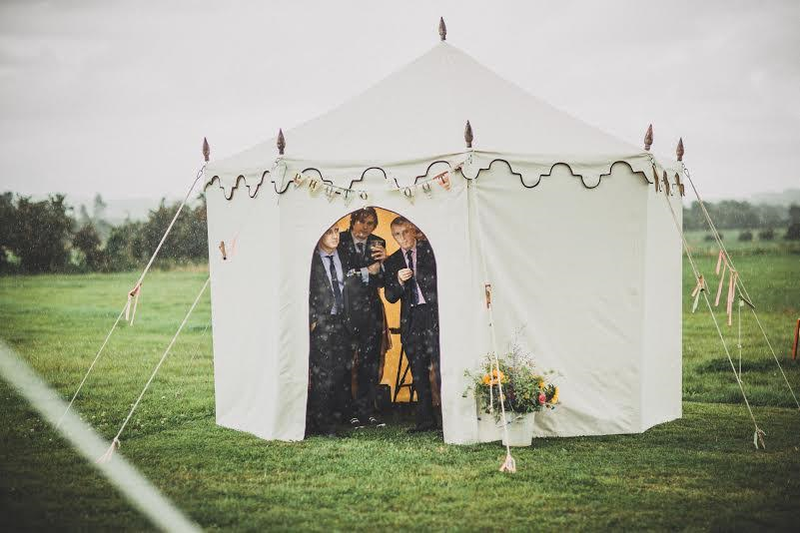 We recommend the use of our gala marquee 6 metres by 12 metres for celebrations where there are more than 130 people. The bar fits nicely in this space and it creates an indoor ‘chill out area’. It can of course be used for other things apart from a bar area! Cost £400 including putting up and taking down and the lining. We have a range of bits and pieces to help your guests enjoy themselves and make the most of all the space on offer. These include - tug of war rope, hessian sacks, space hoppers, limbo, frisbees, quoits, balls - and more.